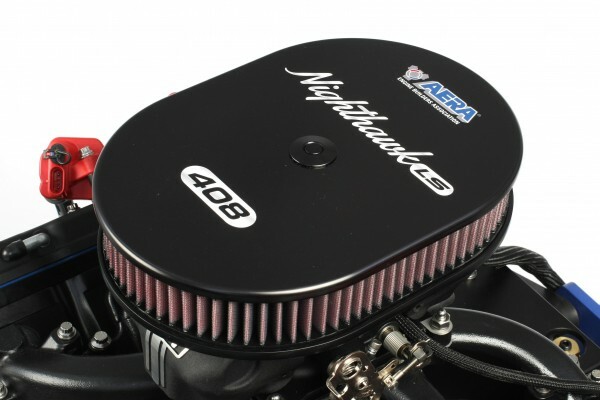 Back in Black Nighthawk LS (Part 3): 629 Horsepower from a 408 LS Engine! Editor’s Note: Mike Mavrigian’s shop, Birchwood Automotive, specializes in street performance and racing engines as well as vehicle restoration. We covered his last build, a 499 cubic inch Mopar 400 big block. 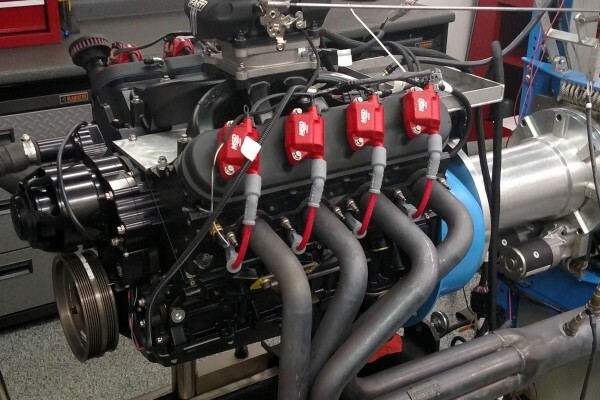 This time, he’s building a 408 cubic inch LS engine based on a 6.0L cast iron block. In this final installment, we’ll highlight the induction and ignition systems, button up the engine, and go to town on the dyno. 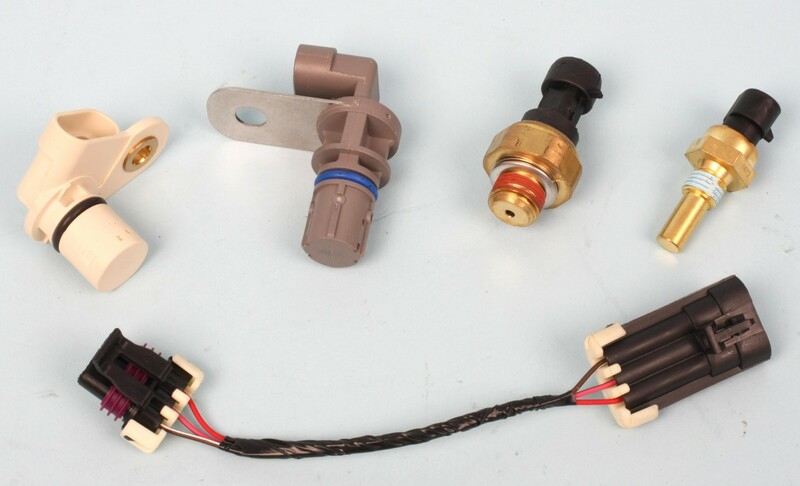 Our Standard Motor Products sensors are from (left to right): camshaft position sensor; crankshaft position sensor; oil pressure sensor; and water temp sensor. An OE cam sensor harness is required to install the camshaft position sensor. The crankshaft position sensor installs in a sensor port on the right rear side of the block, secured with a single 8mm x 1.25 bolt. Remember that cam and crank sensors must match the style of crankshaft reluctor wheel (24 or 58-tooth). Our crank is fitted with the LS2 and later style 58-tooth wheel. After the camshaft position sensor is installed, we bolted on a TCI adjustable timing pointer. 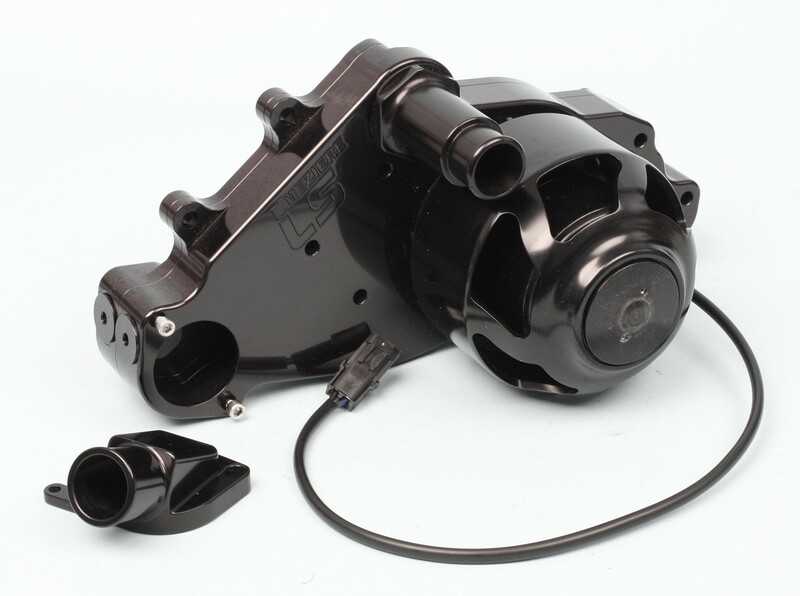 Since the theme of the Nighthawk LS is black, we chose a black anodized Meziere electric water pump. 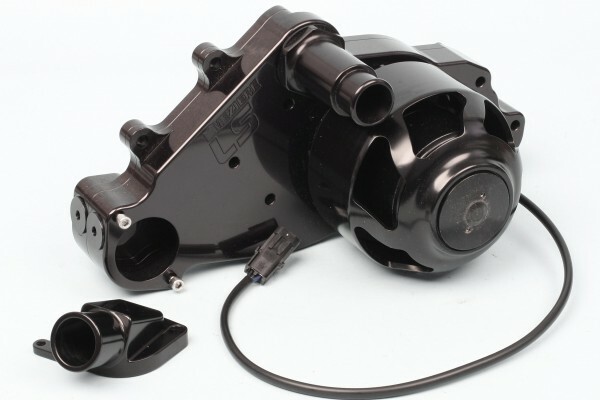 Rated at 55 gpm, it features an idler pulley to accommodate an OE belt, epoxy coated motor windings, an RF suppression circuit, and a one-piece carbon-ceramic seal. 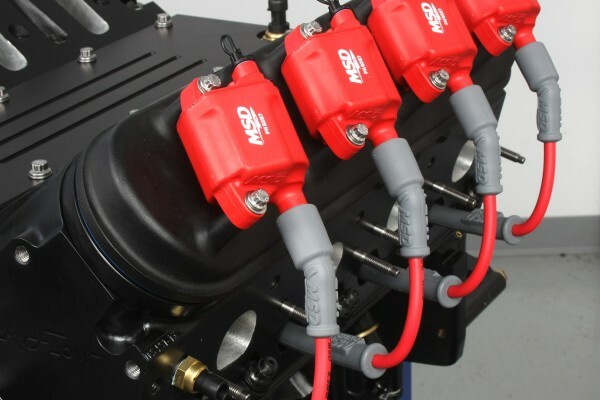 Our MSD coils put out 40,000 volts of spark energy, and have the 72mm bolt spacing required to fit our Holley and other aftermarket valve covers. 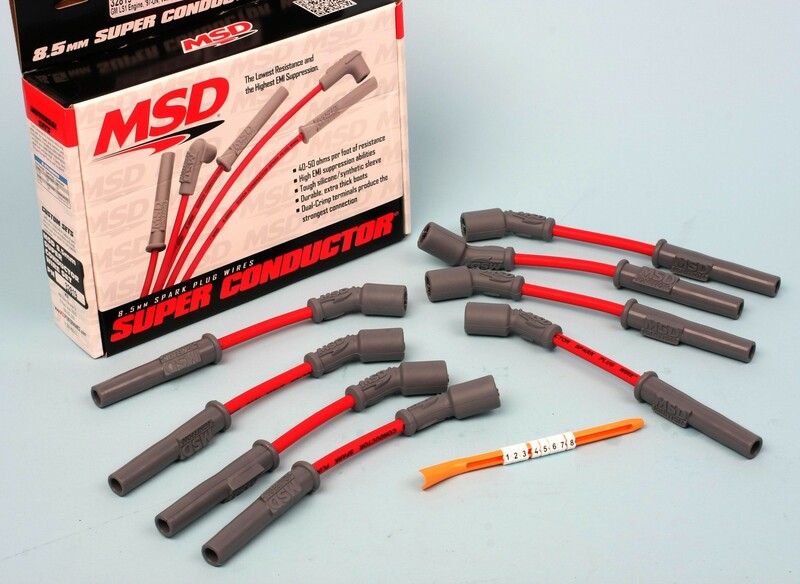 The MSD Super Conductor spark plug wires are supplied ready to install. We added a bit of dielectric grease to each boot cavity to make the wires easier to remove. The spark plugs are NGK V-Powers. 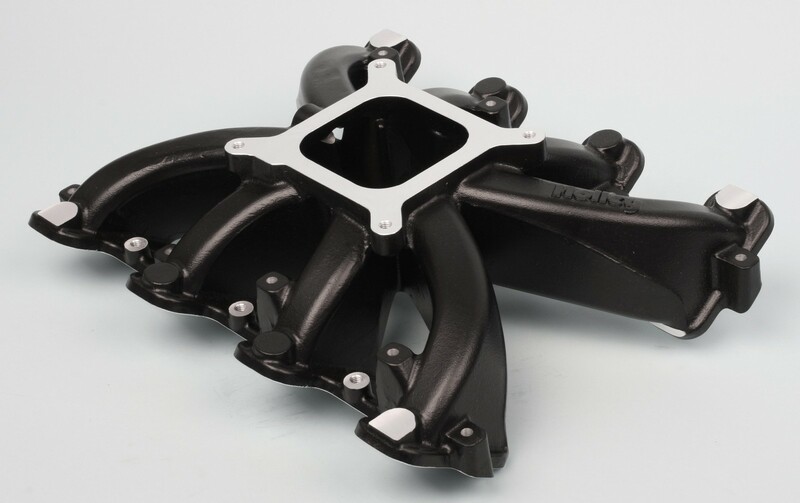 Our Holley single-plane intake manifold features a black ceramic coating, cathedral ports (LS1/LS6/LS2 style), and makes power in the 2,500 to 7,000 RPM range. The 4150-style squarebore flange accepts carubretors and EFI throttle bodies with throttle bores up to 1.75 inches in diameter. 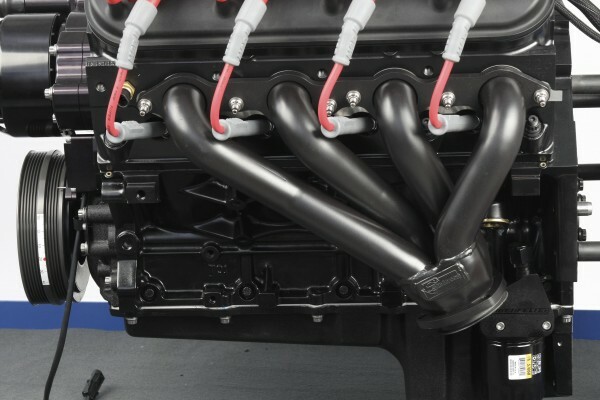 The Holley intake manifold features O-ring grooves at each intake port, sealed with supplied O-rings. This is a much neater sealing method as opposed to using a full-length gasket. The FAST EZ-EFI 2.0 kit includes everything required for fuel management, including an inline high pressure fuel pump and adjustable regulator. For LS applications, a FAST EZ LS ignition controller is also required. It connects to the EFI system’s main wiring harness. 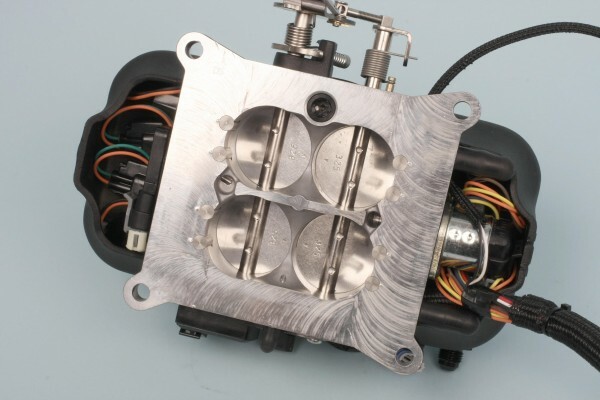 The FAST EFI throttle body houses the fuel injectors behind faux fuel bowl covers. 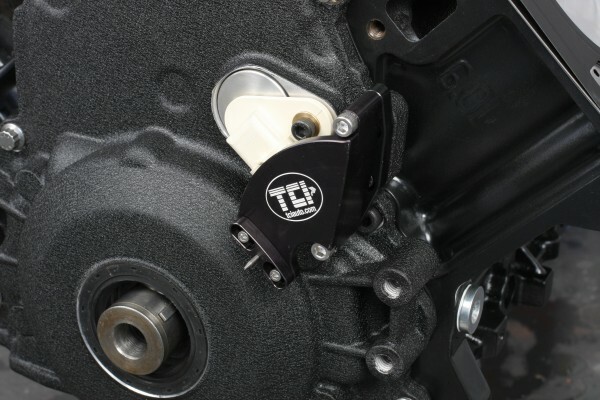 The throttle body features two harnesses—one for the EFI controller and one that connects to the water temperature sensor on the left cylinder head. This underside view reveals the injector connectors. The throttle opening (primary to secondary) is progressive. On dyno, throttle response was scary quick. 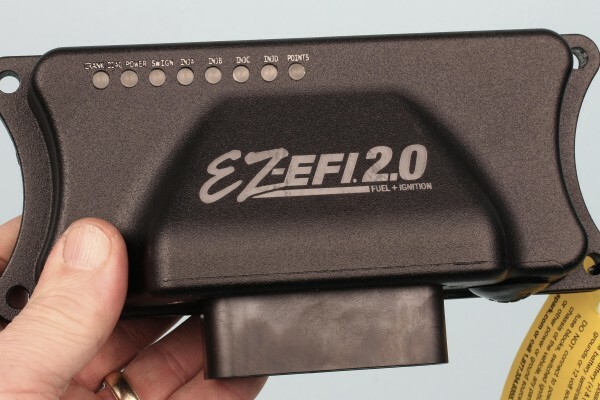 The FAST EZ-EFI control module can be installed in the vehicle interior to protect it from heat and weather. We modified the Billet Specialties air cleaner by enlarging the mounting hole to accept a quick-latch push-button release. We had the lid anodized in satin black. 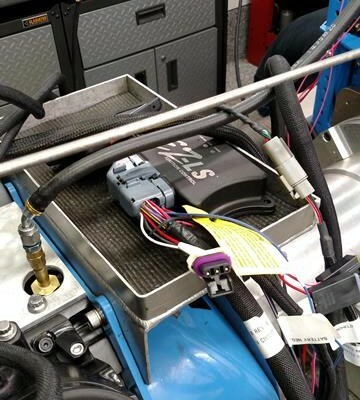 The FAST LS ignition controller (seen here on the small shelf on the dyno) is needed for an LS applications as there the engines do not use a distributor. We always pre-oil every engine prior to initial firing. We installed an adapter in place of the OE style oil pressure sensor at the top rear of the block. The adapter features a 1/8” NPT port for easy connection to our pre-oiler and and the dyno’s oil line. The pre-oiler is easy to use. We put 4-5 quarts of oil in the tank, charged the tank with 45 psi of shop air, and connected the hose to an oil port. Once the engine’s oil passages have been charged, we drain the oil and refill with break-in oil. 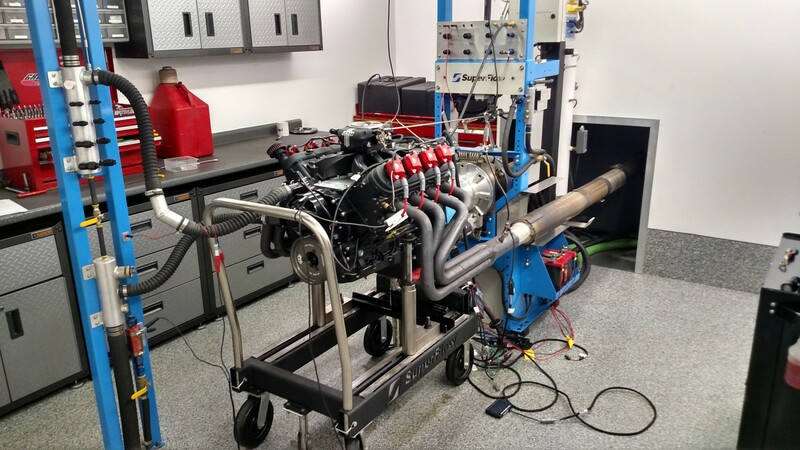 Our Nighthawk LS on Gressman Powersports’ Superflow engine dyno. 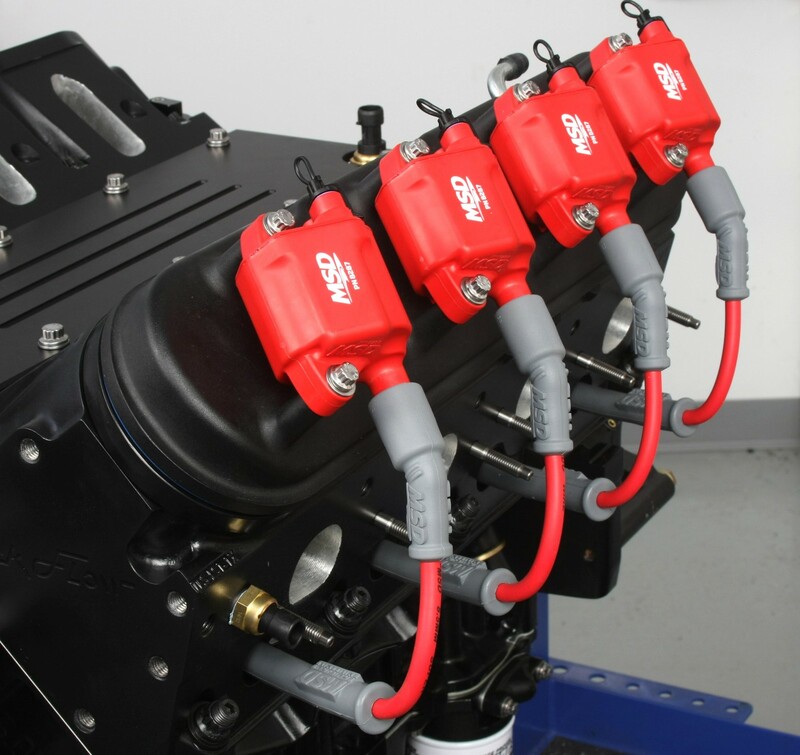 The FAST EFI system’s small wired remote hand-held controller walks you through system setup and allows extensive tuning and data gathering. It’s really quite impressive. Once Scott Gressman got through the manual and made a few calls to the FAST tech folks to help us with the wiring connections, the system worked like a charm. Just for fun, Scott installed a 2-inch carb spacer under the throttle body for one of our pulls. It added an additional 10 horsepower right off the bat (639.5 peak horsepower). We didn’t use these Sanderson headers for dyno testing, but they will be used when the engine goes in a vehicle. The headers feature 1.75 inch primary tubes and 3 inch collectors, and fit so well I wanted to bolt them on over and over again. Sanderson notes that these headers feature a patented flange design that requires no flange-to-head gasket. Our intake manifold is a Holley four-barrel single plane intake with a black textured ceramic coating. 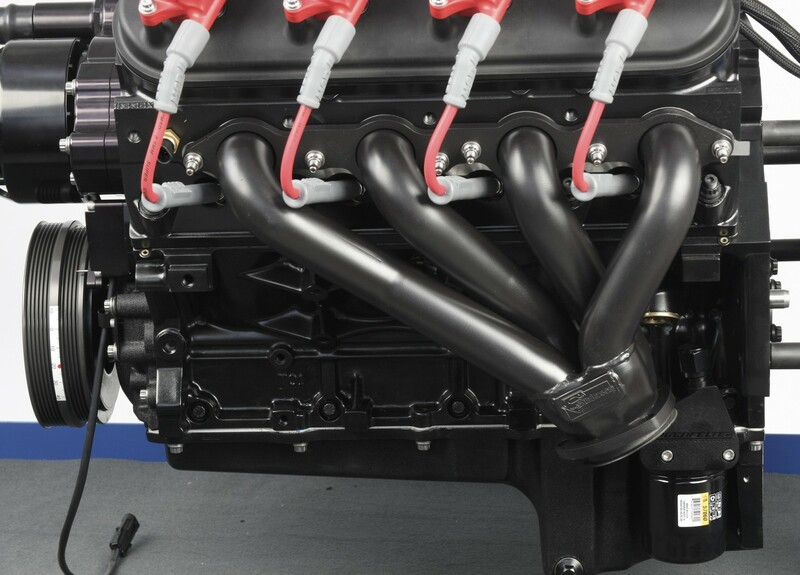 The cathedral ports are sealed with supplied O-ring seals, eliminating the need for traditional intake gaskets. Operating range is 2500-7000 rpm. The intake was secured with ARP polished stainless 12-point bolts and washers. 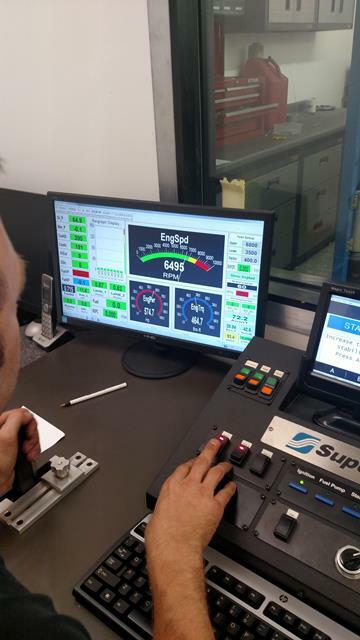 We used FAST’s EZ-EFI 2.0 system on our 408. The throttle body features fuel injectors hidden from view behind faux fuel bowl covers. 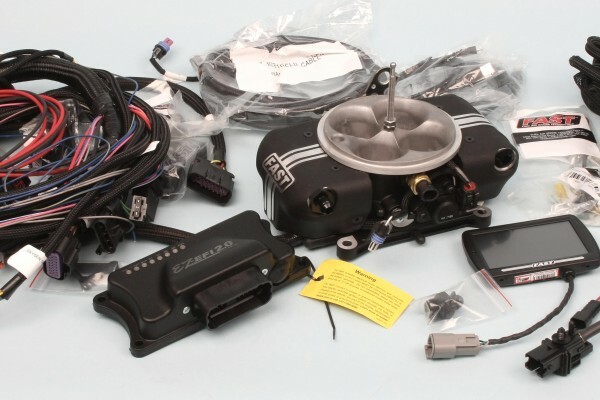 It also has a built-in throttle position sensor, air temperature sensor, and harness connections for water temperature (labeled CTS for coolant temperature sensor) and the EFI controller. The throttle body is designed for square bore type carbureted intake manifolds. Running a carb on an LS engine only requires a MSD 6LS or 6LS2 ignition control module (depending on reluctor tooth count) and harness. 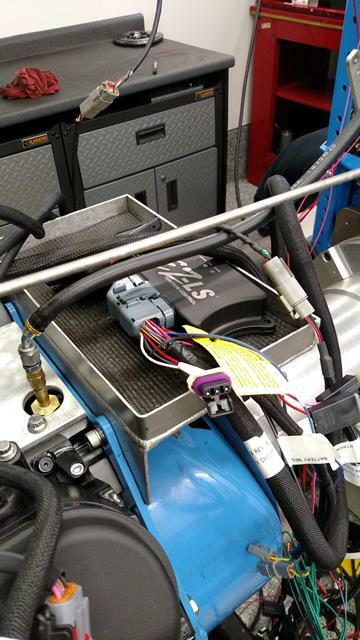 Since we’re running EFI, we used a FAST ignition controller to control both fuel and spark. The multi-connection wiring harness looked intimidating, but the supplied instructions (yes, we actually read them) made things much easier than we first thought. 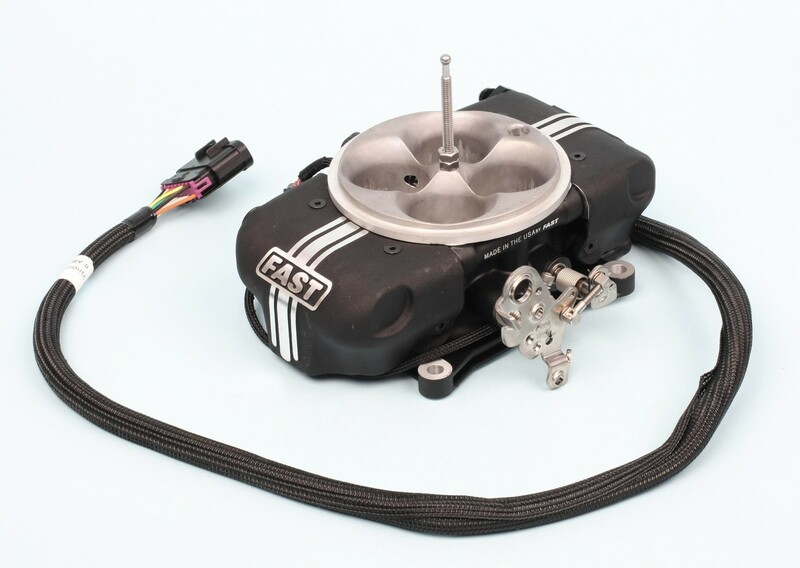 The EFI main harness includes several connections that we don’t need on on the dyno (fans, crank trigger, etc.). For in-vehicle installation, just about every connection that could be needed is included. The FAST ignition controller harness has a connector for the cam sensor and a separate adapter cam sensor harness. You use one or another depending on the cam sensor you have. In our case we used the sensor adapter harness plugged directly to the sensor. The harness’s crank position sensor connector plugged into our crank sensor with no hassle. Trick Flow recommends NGK-4177 spark plugs for their GenX cylinder heads.We gapped these at 0.050-inch. 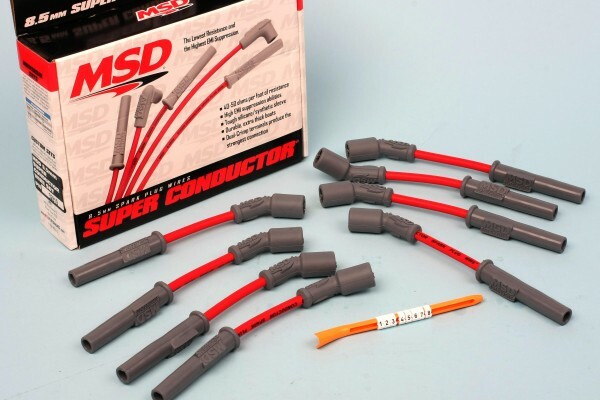 We used MSD coil packs that fit 2005-2013 LS2/LS3/LS7/LS9 engines. Regardless of which spark controller is being used, you’ll need an OE coil harness to connect the coils to the main controller harness. We purchased two coil harnesses, one for each bank. The plug wires are MSD’s Super Conductors. We applied a dab of dielectric grease to the inside of all coil and spark plug boots prior to installation. We used Standard Motor sensors on the engine: a water temperature sensor installed to the forward exhaust deck of the left hand head; a camshaft position sensor installed on the front cover; an oil pressure sensor at the top rear of the valley deck; and a crankshaft position sensor installed at the right rear of the block side. Since the left and right cylinder heads are identical, the unused threaded water hole on the right head must be plugged with a 12 x 1.5 x 16mm bolt and sealing washer. For the dyno, we removed the oil pressure sensor and monitored oil pressure via an Auto Meter brass adapter (ATM-2268) attached to the dyno’s oil line. The adapter has a 16mm x 1.5 male thread and a 1/8-inch NPT female threaded hole. We used a Meziere electric water pump. Using a COMP Cams front cover with this pump produced slight interference between the back of the pump and the inboard edge of the cover’s cam sensor bung. If the pump rocks a bit when you install it, do not try to force it on by tightening the bolts. To get the pump to mate flush with the block, we ground about 1/8-inch off the inboard edge of the cover’s cam sensor bung lip at about the 10 to 11 o’clock position. You may need to chamfer-grind a bit of material from the back edge of the pump body where it contacts this sensor bung protrusion. A chamfer about one inch long, 1/4-inch wide, and about 1/8-inch deep eliminates the interference. The grinding areas will not be visible once the pump is installed. 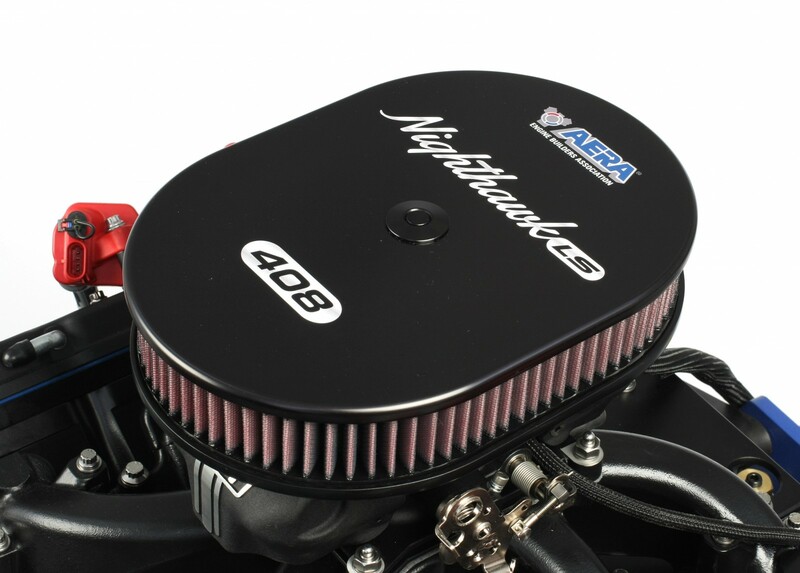 The Holley valve covers are cast aluminum and finished with a black ceramic coating. The covers are factory height and the COMP Cams roller rockers contact the valve cover baffles. Rather than cutting the baffles out, we installed aftermarket half-inch thick billet aluminum spacers to provide adequate rocker clearance. The spacers we used feature a machined groove on the bottom to accept an O-ring sealing strip (included). Instead of using the supplied hex head bolts, we installed the covers with ARP polished stainless 12-point bolts. You’ll need a set of Fel Pro valve cover rubber grommets (FEL-ES72233). The billet aluminum oil fill cap provided with the Holley valve covers looks like it won’t clear the number two coil pack, but it does by about 0.060-inch. Holley even provides an offset coil mounting bracket for the number two coil that kicks the coil rearward for compressor clearance on vehicles with air conditioning. We had a particular air cleaner design in mind for this engine. 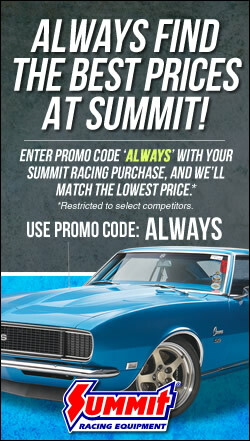 We based it on a Billet Specialties oval air cleaner assembly. It measures 11 7/8 x 8 7/8 inches and features a machined 6061 aluminum top. We enlarged the center mounting hole to 0.750-inch to accommodate a very cool quick-latch push-button retainer/release system from S&W Race Cars. Rather than messing around with a traditional nut or knob, you simply press the spring-loaded button to pop the top off; to lock it back in place, push the top on until it clicks and locks. To prevent the air cleaner base from rotating too easily, we fabricated a small billet aluminum “key” that features a flat-to-flat square base. 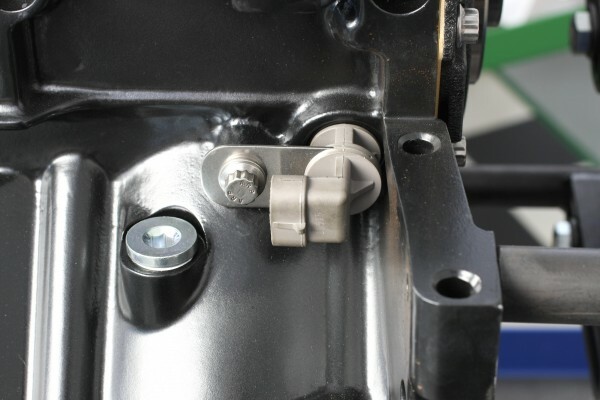 This secures to the top of the right side of the throttle body with a 8-32 stainless flat-top screw. We machined a 6mm peg that projects out horizontally on the right side, then filed a U-shaped groove in the air cleaner base lip to engage the peg. This provides a “register” for the air cleaner so top and base stay aligned. We swapped out the air cleaner’s white filter element for a red K&N filter so it would be better color-coordinated with the rest of the engine. 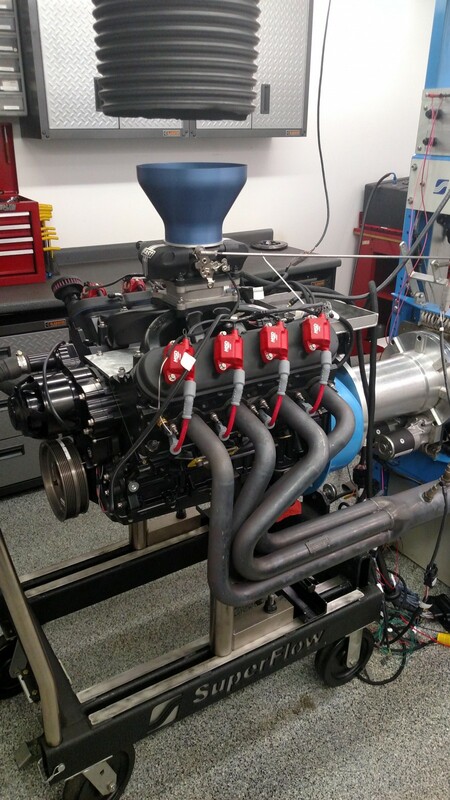 We used the dyno shop’s headers equipped with air ratio sensors during testing. We installed a set of Sanderson headers for photo and display purposes. The headers feature include 16-gauge tubing, 1.75-inch primary tubes, three inch and 3/8-inch thick flanges. 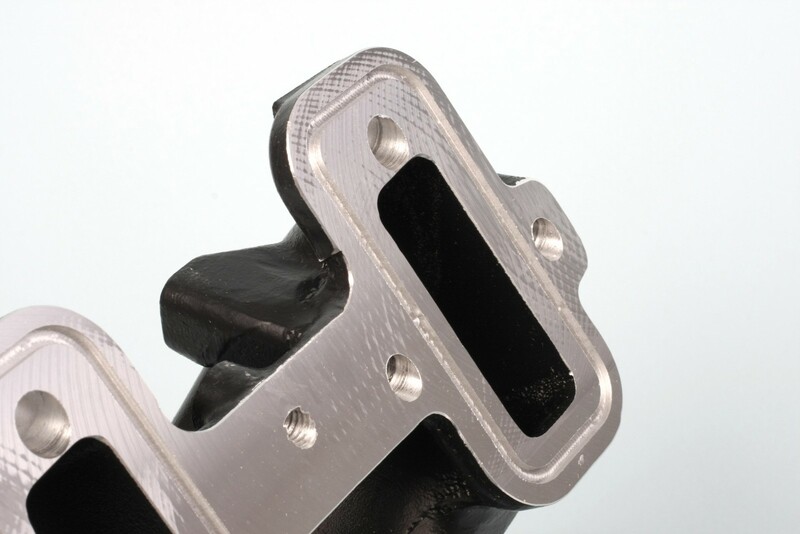 They also have a patented flange design that seals without the use of gaskets. The headers had no clearance issues whatsoever, with no-hassle access to all spark plugs. The engine was dyno tested at Gressman Powersports in Fremont, OH, down the road from my shop. 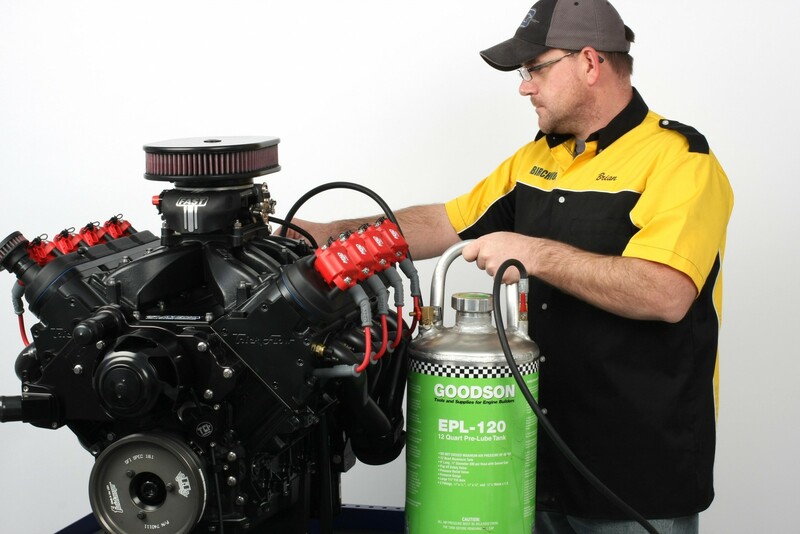 Prior to the dyno run, we pre-oiled the engine using a pre-oiler tank. This insures that oil has been distributed under pressure through all oil passages prior to initial startup. 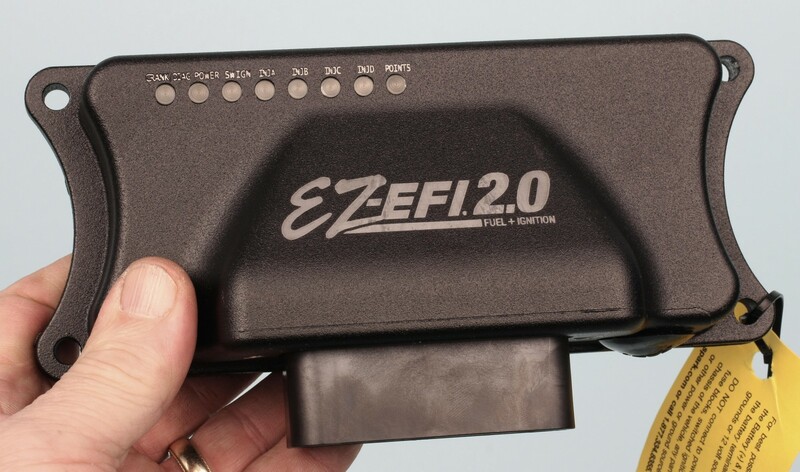 While the FAST EZ ignition control system is LS-dedicated, the EFI system itself is a universal design that works on most any V8 engine. Time and patience is required to determine which connectors you actually need to use for a given application. Plan to spend some time reading the EFI instructions before blindly plodding ahead. We connected the coil harness to the coils and plugged these into the FAST EZ ignition controller harness. The FAST ignition and EFI controllers and harnesses were then installed. Each connector is labeled, but the EFI harness features quite a few connectors that we didn’t need (electric fan control, crank trigger, etc.). 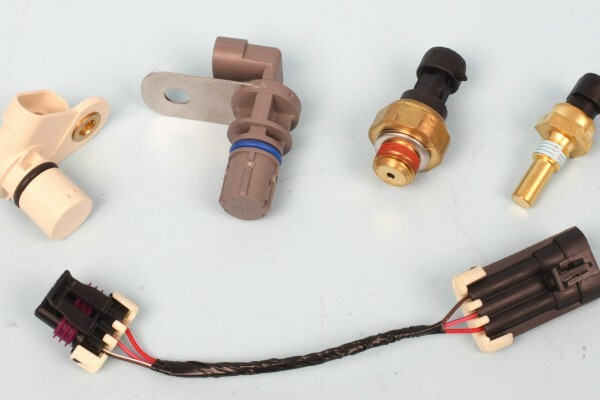 We had to lengthen the water temperature sensor harness from the throttle body as it was about six inches too short to connect to the cylinder head-mounted temperature sensor. We used the FAST system’s hand-held touch-screen for initial setup. The setup wizard is actually quite easy to use. The engine fired and ran flawlessly through four pulls. Oil pressure ranged from 41 to 61 psi, depending on engine speed. Initial timing was set at 21 degrees. 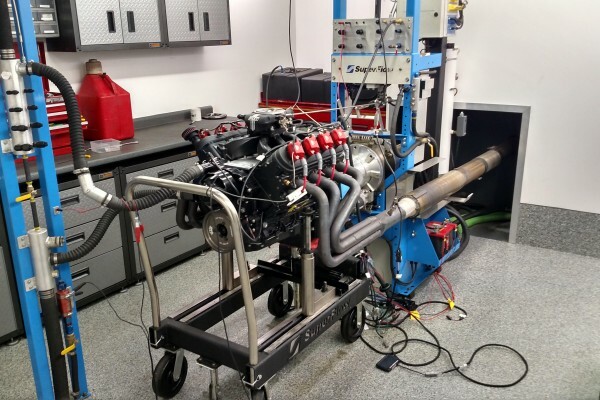 We suspect playing with more timing would gain more power, but we had limited time on the dyno so we really didn’t have the luxury of extensive experimentation. As a quick experiment, we added a two-inch tall carb spacer and picked up 10 more horses between 6,500 and 6,800 rpm. 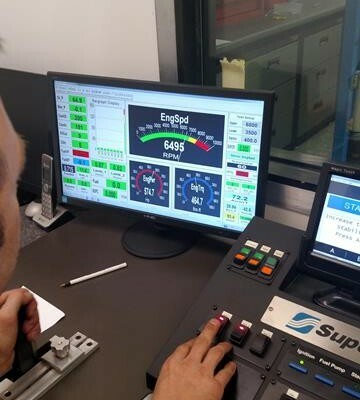 We definitely feel that there’s a bit more to be had once the FAST EZ EFI system “learns” the engine more. A taller intake manifold with longer runners would also help gain additional power at top end.